If you’re experiencing pain in the base of your head, temples or above your eyes then there’s a good chance you’re suffering from cervicogenic headaches. The good news is that it’s a type of headache that usually responds well to physiotherapy treatment. Get help now for your headache by calling 02 9144 1510 or by booking online here. A cervicogenic headache is a form of headache that is caused by structures (muscles joints and ligaments) in the neck. What happens is that the nerves that carry the pain signals from the neck, go to the same place in the brain and spinal cord that deal with pain signals from the head. The brain gets confused and interprets the pain signals from your neck as coming from your head. What can also happen is that the pain signals from the neck also make it easier for pain signals from the head to be communicated into the brain. So if you’re a migraine sufferer, neck problems can make it easier to trigger a migraine. Common pain producing areas in the neck include the suboccipital muscles at the base of the skull, the large trapezius muscle running from the skull to the shoulder and the joints between the neck vertebrae in the top of the neck. 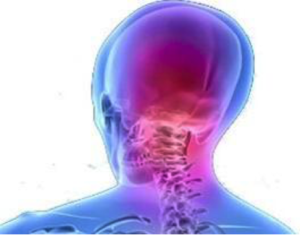 Cervicogenic headaches can be traumatic in origin, for example with whiplash after a road traffic accident, or due to prolonged abnormal load being placed on these structures, such as prolonged slouching or slumping at a computer desk at work. Other muscles, like the upper fibres of the trapezius muscle can also refer to the head after prolonged poor postures and overuse. Manual therapy involving joint mobilisations and trigger point release to allow normal joint movement. This will allow you to be able to maintain a good posture more easily. Soft tissue massage to the symptomatic muscles to relieve muscle tension. Taping to help you prevent over-activity in the symptomatic muscles. Dry needling to reduce muscle tension, reduce the amount of pain the brain produces and promote the release of your body’s natural pain killers and anti-inflammatory’s. Postural correction to prevent any bad habits that can lead to the cervicogenic headache. This may involve tape to help maintain the correct posture. Exercises to provide relief from your headaches in the short term and then to prevent re-occurrences in the future. Ergonomic assessments can improve your workstation lay out to reduce how much you load the painful structures. The exact treatments used will depend on the specific problem or problems that are causing your headaches. After a detailed assessment, your physiotherapist will discuss these causes with you and provide you with a plan on how to best relieve your symptoms and correct the underlying problem. If you have any questions or would like to book in to see one of our physiotherapists, please call 02 9144 1510 or book online here.